From an email question "I am currently working on dosimeters. Lots of queries.. A broad overview of all dosimeters will help (if you can add when you get time)"
firstly why is larger volume of thimble ion chamber sometimes a drawback esp for steep dose gradients. I did understand this at some stage but I am confused after all this reading… is it because of electron disequilibrium? The concept of spatial resolution is not clear and it says compromise between minimizing the volume to achieve best spatial resolution and maximising the volume to improve signal to noise ratio? Dosimeters, obviously, measure dose. Either the measurement is direct or it is by some secondary/related phenomenon. So the ways it is done is to see how many electrons are liberated - not quite dose but close and 'precedes' dose. How to measure electrons, well they are charged, so a potential difference (voltage) will establish an electric field which will make the electrons flow to an electrode (oh my God! "electrons flow" that's a CURRENT!!!) where a current is measured. So liberated electrons are $\alpha$ dose. What other things happen when dose is absorbed. Heat is generated (so you can use a calorimeter as a dosimeter. Bit coarse though, given the temperature change with 1 Gy! Liberated and absorbed electrons will cause chemical changes in redox states of coloured ions - so the changes of Fe3+ to Fe2+ (gain of an electron!). In some fluids, when electrons interact with chemicals there is an excitation change which releases energy as light when it 'relaxes', and if you have a light photon counter, you can then correlate scintillations counted with electron interactions. So you see the dosimeter is usually based on a simple principle. Much of the complication comes in trying to calibrate the measurement with the dose, and noting in which conditions the relationship is true, and when it is not. Thimbles - Does size matter? Unfortunately, yes! The problem of measuring dose is that the larger the sample size of ionizations measured, the smaller the sampling error. This is true for everything. So a bigger thimble will give you a better, more accurate reading. If your very very small thimble measures 100 ionizations and then a stray cosmic electron enters as well, you measure 101 ionizations and have a 1% error. However if your very very large thimble measures 1,000,000 ionizations and another 10 stray electrons enter on a particularly active day for solar flares, you measure 1,000,010 ionizations and you have an error rate of 0.0001%. So bigger detectors lead to smaller errors. That's one part of the story! 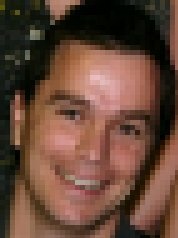 The other part is the spatial resolution. The dosimeter's width can be thought of as a pixel in a picture. Here are three pictures of the same image with just the pixel size changed. In the first with large pixels, it is difficult to accurately identify the surface of the soft tissues, however with reducing size (i.e., increasing spatial resolution) the boundary becomes very easy to identify. With dosimeters it is the same. Recent work has been done on surface dose with film, gafchromic and mosfet dosimeters and the surface dose gets smaller each time. Is this because the dose changes with time or measurement, or because the dosimeter is measuring more accurately because its spatial resolution is better? So you see, as pixel size (read dosimeter size!) gets smaller, spatial resolution gets better … BUT noise component of signal-to-noise ratio gets larger. 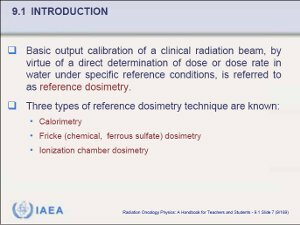 by email: Difference between absolute, reference and relative dosimetry? 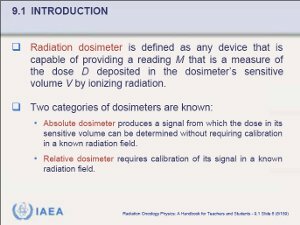 My understanding - Absolute dosimeter is one which does not require calibration and it relies on its own accuracy instead of referring to a standard. They are the ones lying in NIST and other dosimeters around the world are calibrated (directly or indirectly) against these standard ones giving them a constant or calibration coefficient. When we do yearly calibration of a MV beam (TRS-398 absorbed dose to water protocol) .. we use our good calibrated ionisation chamber.. get the reading, put in all the factors, coefficients and corrections) - get our absorbed dose to water at Dmax in Gy/MU — this would be under reference conditions ( reference dosimetry). We also calculate the PDD 20,10 and then put in the formula to know the TPR 20,10 (thats how we do it in our centre). All this using water tank. The weekly QA are then done as a quick check to ensure we are getting the same output value or within tolerance for a particular linac with a particular beam energy using solid water phantoms. In the monthly QA - we also do beam energy check using PDD20/10 to ensure within tolerance value .. these weekly and monthly ones would be relative dosimetry. Does that all sound ok? Or is it that absolute and reference dosimetry is same and all we do is relative dosimetry? ABSOLUTE dosimetry is a direct measure of ionization or absorbed dose under standard conditions, which are things like calorimetry [measure energy deposited which eventually appears as heat], electrons released (in an ionization chamber where electronic charge is measured), or ion formation where the number of valence changes in a known amount of ions is directly related to the number of electrons (chemical dosimeter). Because of the need for accuracy, absolute dosimetry informs a standard and is usually tied to a single government based agency responsible for 'the standard'. RELATIVE dosimetry refers to the use of a dosimeter which has a secondary standard, e.g., film dosimetry, is accurate but relies on the production of a known dose exposure somewhere on the film, so that relative opacity can be related to dose. This dose is actually 'measured' by a reference dosimeter (e.g., machine head parallel plate chambers). REFERENCE dosimeters are produced as an STANDARD-defining exercise which will use an ABSOLUTE dosimeter. This implies that the dosimeter has sufficient accuracy, that it is measured under "Standard Conditions", i.e., fixed and reproducible, to established an absolute reference for other dosimeters. As an absolute standard, all other absolute dosimeters will have been handed in for checking and returned with a certificate that details accuracy and error. It also implies a management protocol for these dosimeters being referenced back to the Standard (or absolute) dosimeter periodically. I think that what resides in the NZ Radiation Laboratory (and its Australian counterpart) is an ABSOLUTE DOSIMETER which forms the STANDARD OF DOSIMETRY measurement in that country [it's REFERENCE DOSIMETER]. The device that your department has which has been certificated by that body but which resides in your department is related this REFERENCE STANDARD OF DOSIMETRY. All the other devices for measuring dose that are internally calibrated within your department are then RELATIVE STANDARDS OF DOSIMETRY. So you see that the word "RELATIVE" can have slightly different meanings (relative dose & relative standard), but reference is a supremacy issue.